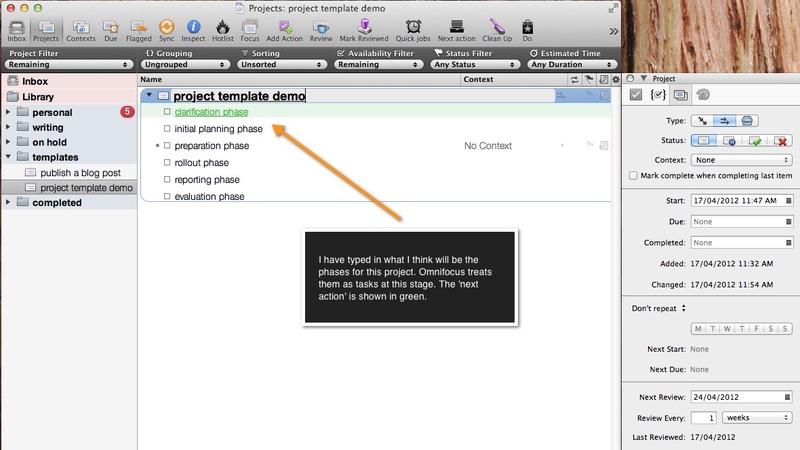 In this post I want to show you how easy it is to set up a project template in omnifocus. Once you have mapped out the tasks that make up your project, you are only one right-click away from turning it into a template that you can use over and over again. The first screenshot shows how I have created a new project, intriguingly called ‘project template demo’, by clicking on the ‘add project’ button in the bottom left of the screen. In the best GTD™ tradition, omnifocus automatically schedules this project for review in a week, but you can edit this frequency. 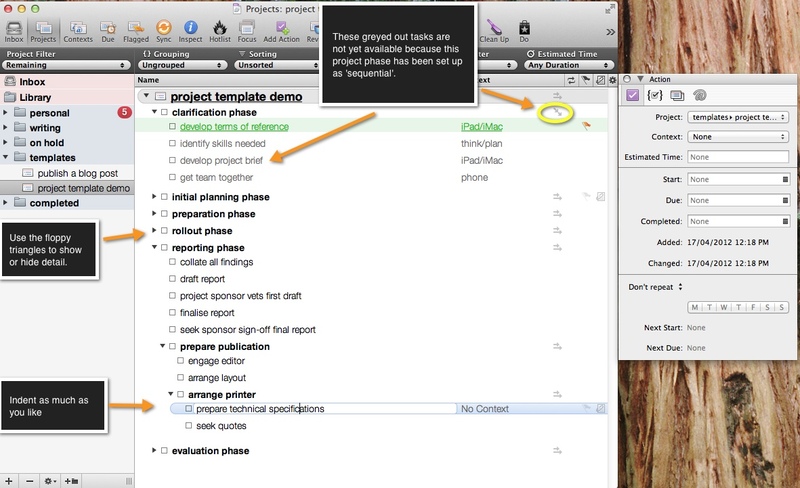 In the second screenshot I have keyed in the project phases that I normally use at work. If you wanted to set up a template for painting a room, your phases might be ‘plan project’, ‘buy materials’, ‘prepare room’ and ‘paint room’. The clarification phase is one of my favourites. It is where you formally empower yourself to track down and dispose of that mortal enemy of a successful project: assumptions. As these phases do not yet have any subtasks, omnifocus still treats them as tasks at this stage, with the ‘next action’ coming up in green. In the next screenshot I have inserted a number of tasks, which has turned the project phase descriptors into subprojects, shown in bold. I meant to write ‘flippy triangles’ – perfection escapes me yet again (dang). Omnifocus has essentially an outliner under the bonnet, and the beauty of this is that tasks can be indented, nested, embedded – whatever you wish to call it – to your heart’s content. In the screenshot above, for example, the task about specifications for printing is four levels in, making it the ‘great-grandchild’ of the project title. Once you have listed your project steps, you can start using the outline as a template. Just right-click on the project and select ‘duplicate’ (which is essentially a ‘save as’) and you can start working on the project at hand, inserting more task detail. You can also use the command button at the bottom of the screen. Best practice would be to review and refine your template upon completion of each project, incorporating your learning from that particular ‘run’. Creating a template is not just about the workflow. You can also attach files, notes, photographs or web clippings to individual tasks in the template, so that key information is readily available each time you embark upon the project. For a painting project, for example, you could insert a link to a diagram in evernote showing the dimensions of the room to be painted, or a photograph of the paint label you need. 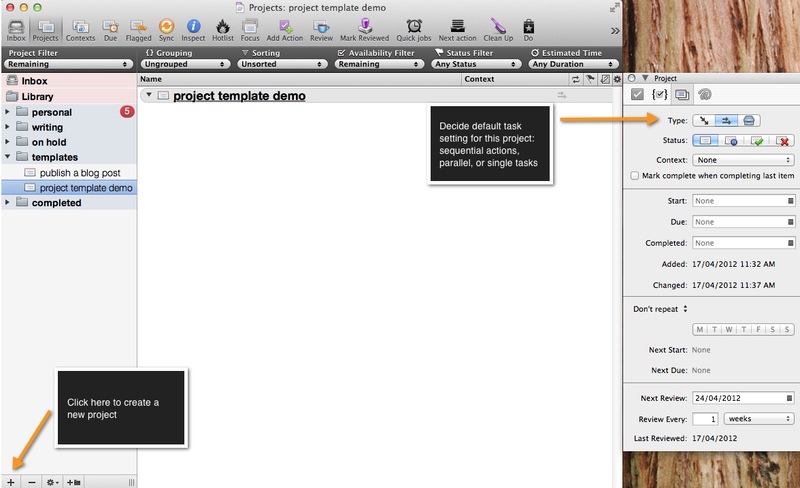 The most obvious benefit of using a template for recurrent projects is that it saves planning time. In addition, templates can be used within a quality assurance/improvement context (processes are well-documented and keep being refined) and possibly as a training/teaching tool for new staff. 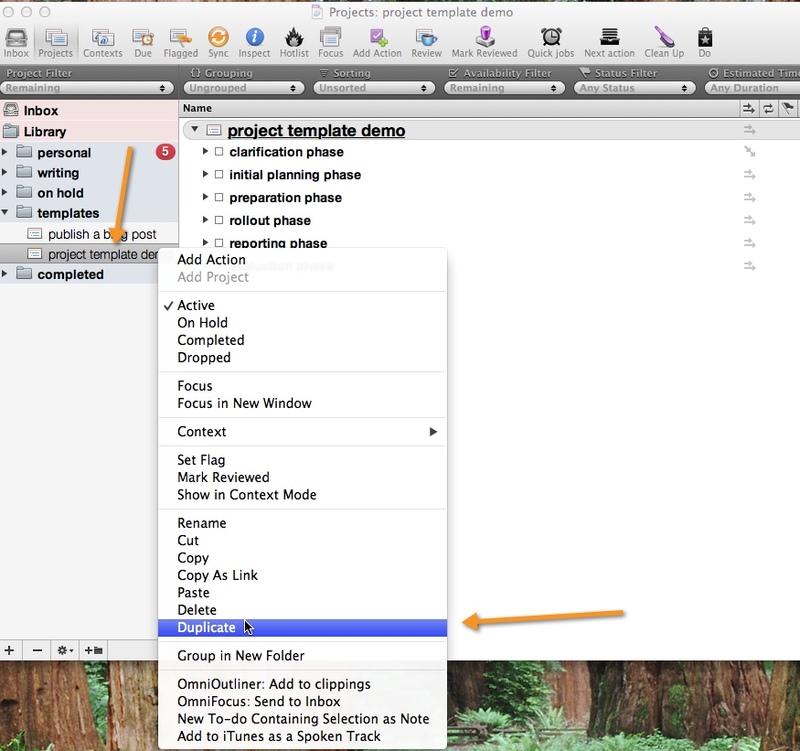 If you would like to explore in more detail the use of templates in omnifocus I can recommend dr kourosh dini’s excellent manual on creating flow with omnifocus. I am sure other readers would be interested to hear about your experience with omnifocus templates. Was it a fizzer or did it give a multiplier effect to your productivity? This entry was posted in productivity and tagged omnifocus, productivity, project management by Gilbert Van Hoeydonck. Bookmark the permalink. I concur. Was just thinking how useful this would be. I use this along with Clifton’s Template Placeholder’s script. Dynamite combination!